I love wicker because it makes me feel like I am at the beach. Well, not really. Living in Colorado a mile higher than the beach definitely has it's own look, but wicker I still love (hubby and I both grew up in CA and love that beachy feel). 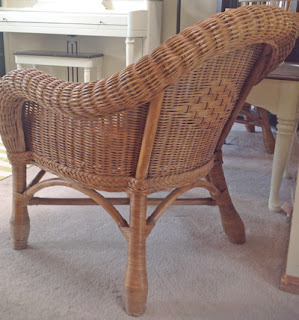 However, most wicker isn't the color I like and so after buying the pair off of Craigslist (pictured above in the Before picture), I knew it needed to be changed. Plus, looking at those hideous cushions I knew I needed to change those too. 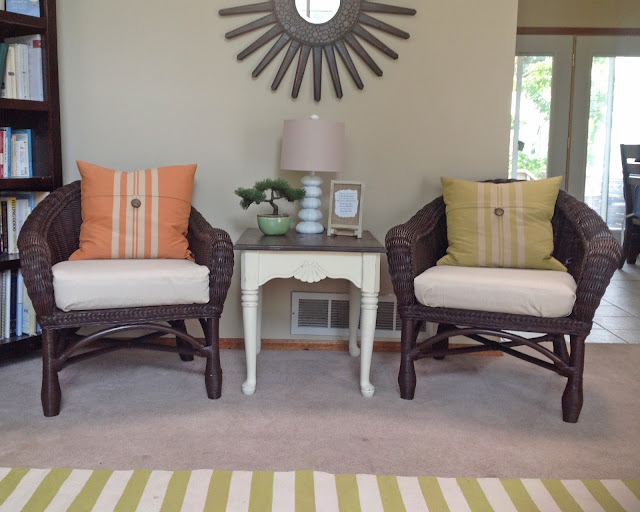 Thankfully I had a way to update the color easily (and in less than an hour), and found a way to update the cushions for $10 and with a staple gun! Like the little blue block? Hehe, oops...should've moved it before taking the picture. But I had bought these for $20/piece and was worried I had made a mistake. I took this picture to try selling them again on Craigslist, but thankfully no one wanted them so I had to transform them. My husband was really questioning my judgment on these and hated them. I couldn't let him know that I was questioning them too, and promised him I could make them look ok. I was a little doubtful. I dusted the two chairs that I bought off of Craigslist. Took 3-5 minutes. Then I wanted them to match the espresso stain we have in our front room and had General Finishes Brown Mahogany gel stain on hand. The Java version would have worked great too (which is typically used for the espresso look, but I had the brown mahogany and was ok with the extra hue of brown). I knew that staining these by hand would have been a nightmare with all of the holes and details that make up wicker furniture, and that would have taken hours, (and probably would have looked horrible). So once again my trusty Wagner sprayer came to the rescue. Seriously people, for less than $100 your life will be transformed! I left the chairs on our lawn to dry for an hour. Then moved them into our garage. The next day I took them back out to our front lawn and sprayed them down with polyurethane in a satin finish to protect the stain and give it a finished look. Took 5 minutes. The whole time it took to work on them? Less than an hour. 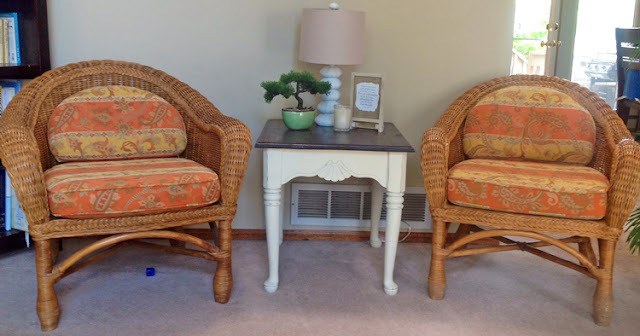 And it is a rarity that I keep furniture (rather than sell it), but I chose to keep these because I have always wanted matching club chairs for that spot in our living room and these fit the bill. After having them for over a month, and with four little boys jumping all over them, they still look like I bought them that way. They feel smooth, clean, and look perfect. Oh, and I was worried about how it would be cleaning out my sprayer when it came to using stain. All I did was rinse out the canister, then swirled mineral spirits in it til it looked mostly clean. Then I put a little extra mineral spirits in it, went outside and turned on the sprayer until no more mineral spirits came out. Took 5 minutes and the sprayer was clean as a whistle for when I put paint in it a day or two later. These cushions had me stumped for a little while. I was going to try painting them...yep, painting them using textile medium you can get at Michael's. I even tried to, but didn't like how the first coat felt. I am not giving up on the idea of painting upholstery in the future. I have read some promising articles, but I doubted how these cushions would turn out, and changed my mind (and direction) after one coat. I then got several quotes from people who know how to sew (cause I can't and I don't really want to learn how), and one was for $40 per cushion and another was $20 per cushion (but was almost an hour drive to drop them off). That was just for labor! I was going to provide the canvas material and the cushions (from inside the hideous covers that came with the chair). And I totally get it. 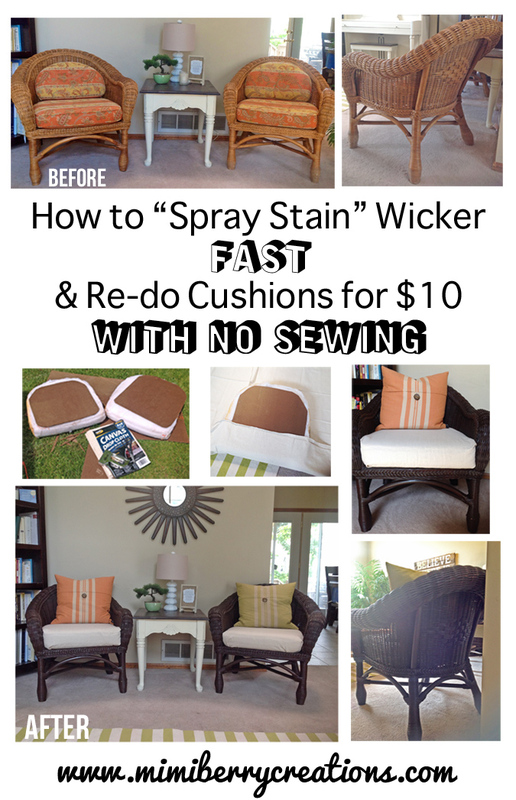 I would need to charge $100 per cushion if I were to do it because it would take me hours! But since I bought each chair for $20 I couldn't spend more effort or time on the cushions. 1. Bought a 9' x 6' tan canvas drop cloth from Lowes for $10. 2. Took off the cushion covers and put them on a particle board scrap I had from another project. (A huge piece of this stuff is about $10 at Lowes or Home Depot...and I mean HUGE). I drew an outline of the cushions on the board and used my Dremel Sawmax to cut out the shapes, but several inches smaller all around so that when sitting on the cushion you wouldn't feel the board underneath. I didn't care how neat they looked since they would be covered. If you don't have a Sawmax you could maybe use a strong X-acto knife. 3. I laid out the board and cushion on the drop cloth (probably should iron it first, but I am lazy and I didn't). Pay attention to where seams are in the cloth and avoid those. Give yourself approximately 8 inches of canvas around the perimeter of the cushion so that you can pull it over the cushion and staple it to the board. Once again, it doesn't need to look pretty. 4. 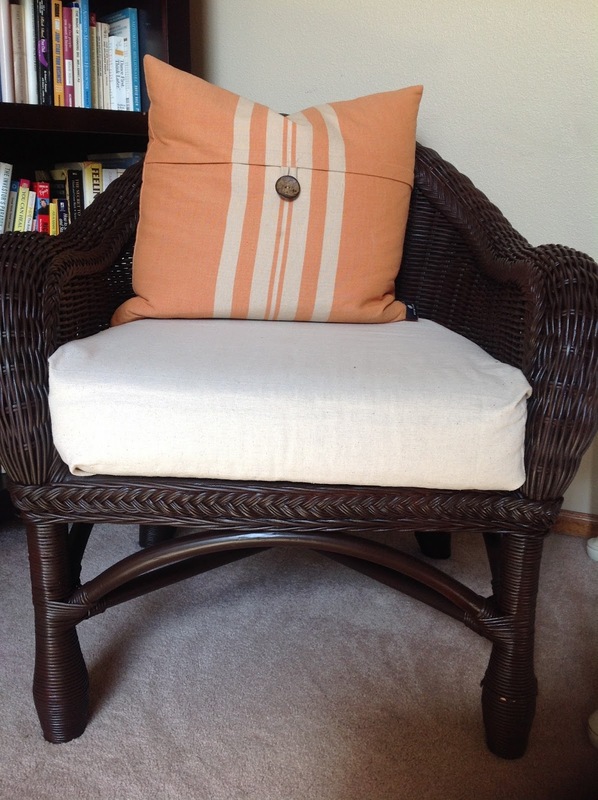 Start with the part of the cushion that is in the front of the chair, and pull it taut and staple. Then fold it nicely around corners and pull it taut and staple. Be fairly liberal with the staples. And that above is how it looks underneath when all done. Seriously so easy. 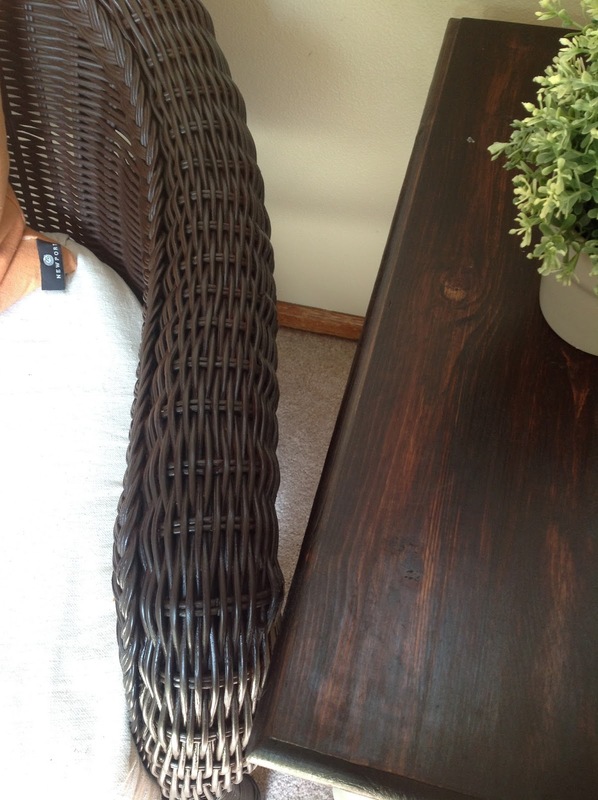 I put the two cushions back on the chairs and stood back. I already had the two "beachy" throw pillows that matched and seeing how they looked made me do a happy dance. Don't look too close to the cushion because I am not an expert yet at the fold, pull, staple. The other chair's cushion turned out better, but I am being honest with you and letting you see the less than perfect look I achieved. However, I have to say that the spray staining method did achieve an almost perfect look (even though my cushions aren't 100% perfect). Totally gonna spray stain so much more in the future now that I know how easy it is! You will notice that I didn't redo the back cushions. I didn't for two reasons: 1. They are small and weird and not super comfortable, and 2. I didn't know how to. (Not without sewing that is, and sewing is not an option around here). So what do you think? Not too shabby for $10 and two hours total working on the entire transformation huh? 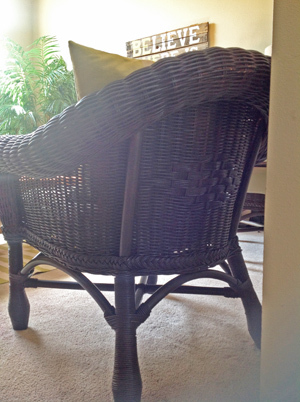 Any of you out there know of another non-sewing way to update chairs or other upholstery? Please share! And if any of you have painted upholstery let me know what you used (textile medium, chalk paint, etc) and what you thought of the results. I love hearing any and all creative comments or questions so please comment! Looks very nice. Did you keep them or you actually sold them? Thanks! And I did keep them. They are holding up well and I keep wanting to figure out what to spray stain next!